Alcohol sales - including wine, liquor and craft beer - have thrived in spite of, or maybe because of, high unemployment. 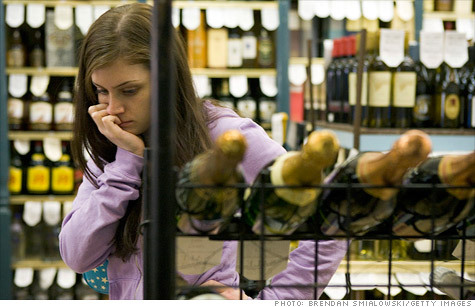 NEW YORK (CNNMoney) -- Alcohol sales climbed with little interruption throughout the recent recession, and have continued to expand in recent months. This is in spite of -- or maybe because of -- the stagnant job market. So the old adage -- that the booze industry survives in a recession because people drink even when they're broke -- appears to be true. "I wouldn't say it's recession proof," said Esther Kwon, an alcohol industry analyst for Standard & Poor's. "People will buy less and they will move to different venues, meaning moving to home instead of a bar. But people will continue to drink, regardless." Alcoholic beverage sales grew by nearly 10% during the 12 months ended May 31, according to financial information company Sageworks, even though the average unemployment rate during that time exceeded 9.3%. Sales expanded more than 9% in 2008, the first full year of the recession, when the average unemployment rate was 5.8%. Sales slumped dramatically the following year, but were still 1% higher, as the unemployment rate shot up to about 9.3%. In 2010, sales jumped more than 9% as unemployment grew to 9.6%. "These numbers grew almost in spite of the recession," said Sageworks analyst Sam Zippin, noting health care was the only other industry to maintain growth through the recession. "Other than going to the doctor, [alcohol] is another need to have." It's not just the manufacturers who are benefiting. Sageworks found that other categories of the alcohol industry maintained growth throughout the recession, including retailers, wholesalers and bars. Wine and spirits experienced uninterrupted growth, as did the high-end craft beers. The loser appears to be the so-called "legacy beers," including iconic brands such as Budweiser. "It appears that some of the mass-produced beers, Coors and Budweiser, are getting squeezed," said Zippin. "[Consumers] are either going to really low cost beers, like PBR (Pabst Blue Ribbon), or they're going to the craft beers." Coors Light, from Molson Coors Brewing, managed to carve out a sales gain of 1.1% in 2010, according to statistics from Standard & Poor's and the industry publication Beer Marketer's Insights. But sales for Miller High Life, also from Molson Coors, dropped more than 4% last year. Sales for Budweiser, the flagship brand for Anheuser-Busch InBev Inc., plunged 7.3% in 2010, while Busch sales dropped more than 6%, Bud Light sales slipped nearly 2% and Natural Light fell 3%. "The economy has been a major driver of declines within the industry," said Dave Peacock, president of Anheuser-Busch, a subsidiary of Anheuser-Busch InBev (BUD). "The unemployment rate among core blue-collar beer drinkers remains three times that of more affluent, white-collar consumers." Peacock said his company "remains focused on things we can control" and that "we feel good about our marketing and the plans we have in place for our brand portfolio." Molson Coors (TAP) was not available for comment. But craft brewers have had a different experience. Sales at Boston Beer Co., (SAM) the maker of Samuel Adams and the market share leader in this category, edged up 1.7% in 2010, according to the S&P report. Other craft brewers fared better last year, with Sierra Nevada Brewing Co. increasing its sales by 7.8%, Magic Hat Brewing Co. gaining 14.8% and New Belgium Brewing Co. soaring 18.3%. "The craft beer costs more, but the consumers are saying, 'We're getting something different here and we're willing to pay for it,'" said Kwon. Paul Gatza, director of the Brewers Association in Boulder, Colo., said that consumers are showing a preference for craft beer with stronger and more experimental flavors. "A lot of beer drinkers are finding that they like hoppy beers," he said. "One of the more hop-influenced styles is India Pale Ale, and IPA is growing over 40% compared to a year ago." Gatza said that craft brewers are also benefiting from the local loyalty of their consumers, who are willing to pay extra to support independent brewers in their own communities. "The brewers are doing their part by putting out interesting quality beers," he said. "The consumers are doing their part by supporting local companies. Retailers are adding shelf space for craft brewers. It seems like things are running on all cylinders."